Posted by Nick Prescott on 22 January, 2019. 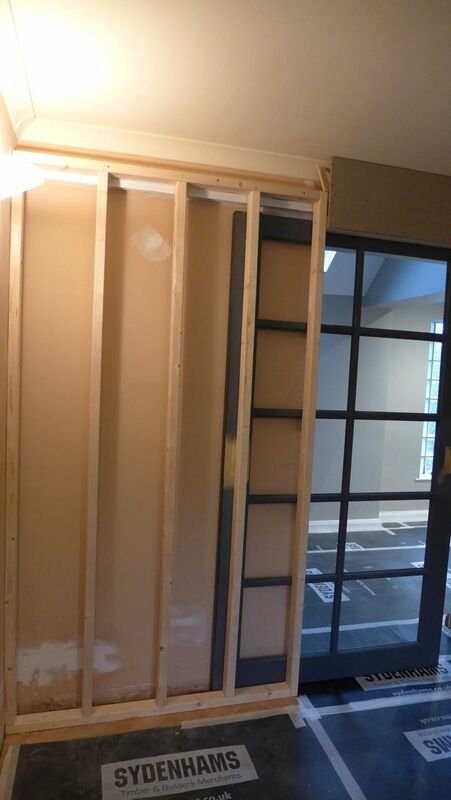 We suggested a pocket door in a style which suited our overall plan for an art deco look for the space. This included a new oak parquet floor, and bespoke coat storage. First, we want to thank the guys at Portman Pocket Doors. As it turned out, we only needed to purchase their track and running gear, which was of the highest quality. 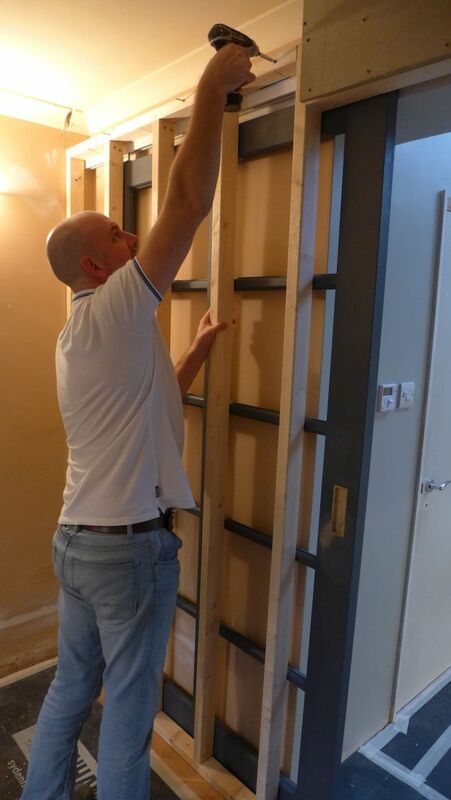 With our design, we were actually constructing a top-hung sliding door concealed within a partition; but the principles are very similar to the complete pocket door kits sold by Portman. Ordinarily, you would see the side-hanging gear for a sliding door on the outside of a wall, sometimes covered by a flimsy fascia. It’s not particularly attractive and often puts people off the idea. 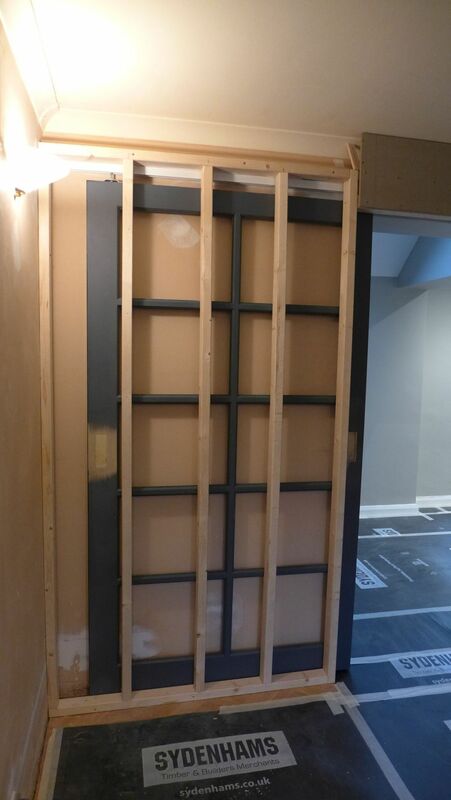 But by concealing the track behind a full partition, it becomes a pocket door and the look is one of simple elegance. 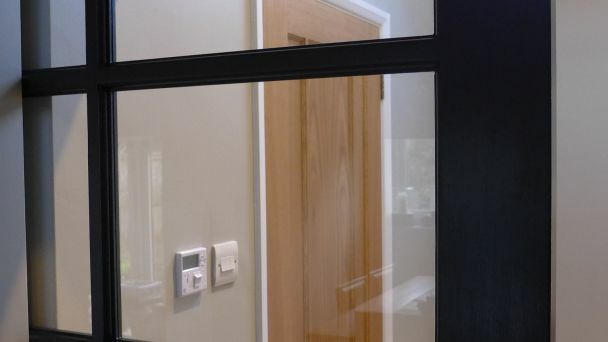 By choosing an architrave free solution, we further disguised the construction – the door simply disappears into the wall. 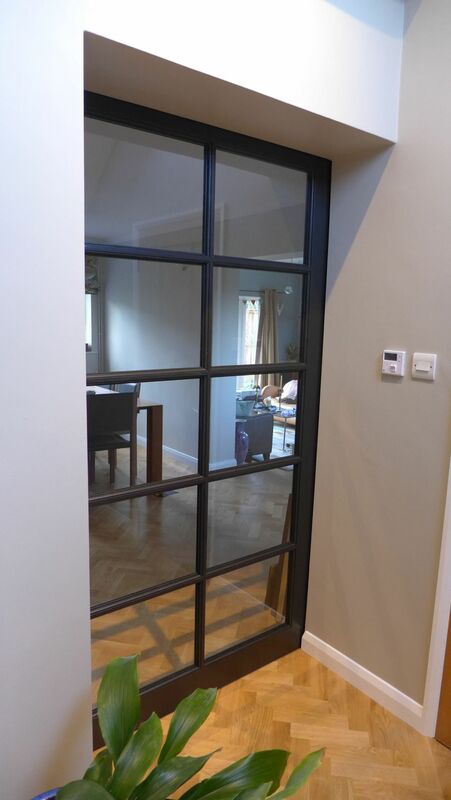 A pocket door only takes up around 120mm in depth which, for most rooms, is insignificant. 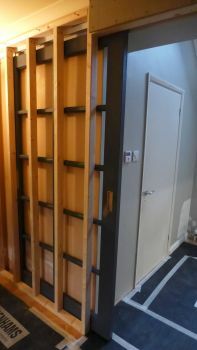 In this case, we also had a short return wall opposite into which we set a 20mm deep slot for the door to fit neatly when closed. 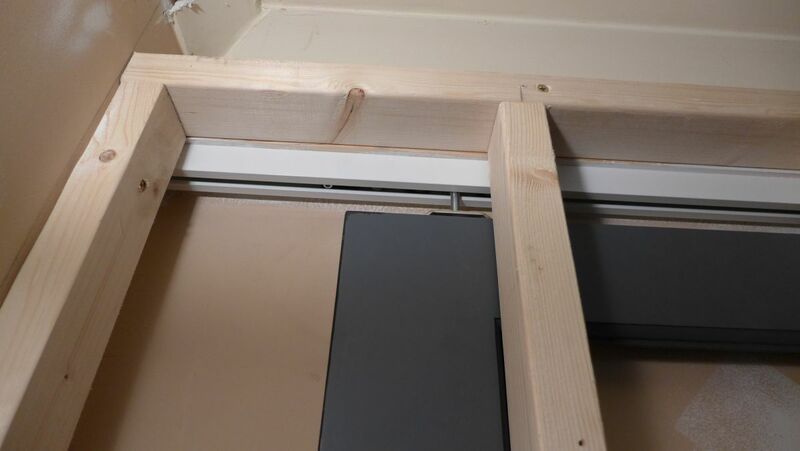 Portman’s upper fittings comprised a top fixed 2.5m track from which the door hung on two rollers. 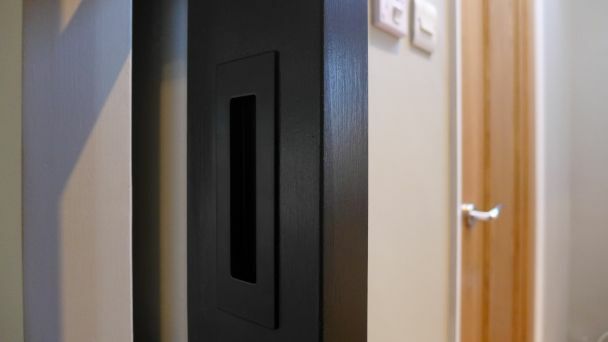 In fact, the rollers settle nicely into a dip in the track’s buffered end stops to give a satisfying, positive location when fully open and fully closed. 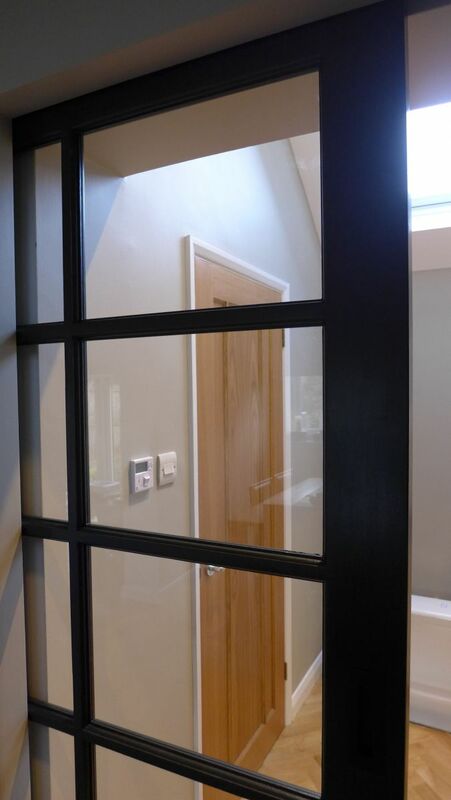 We drew the assembly to scale to locate the upper timber in the right position to suit the planned door height. We made sure there was sufficient finger space to pull the door open and closed. Our joiner designed the stiles so that the door would look symmetrical when in the closed position. 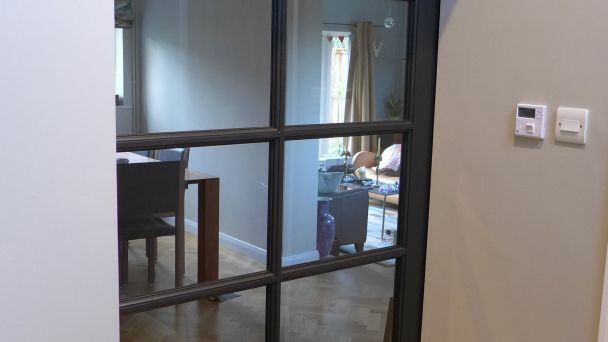 He used safety glass panels secured by glazing bars and beads with mouldings to match those elsewhere in the house. The stylish black finger pull then completed the look. 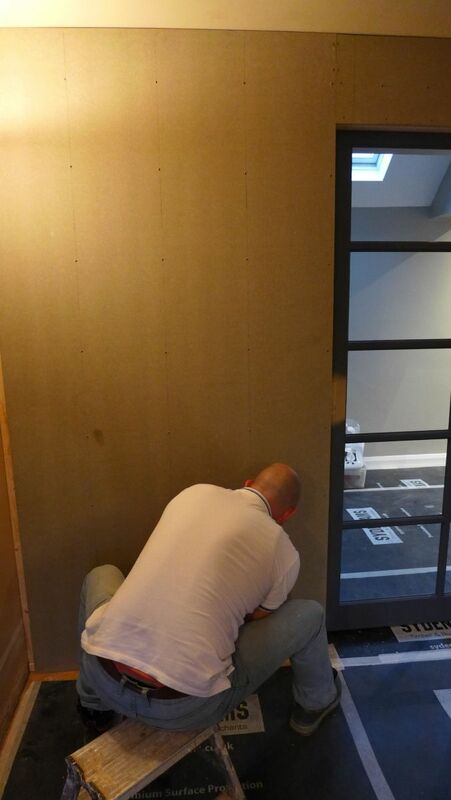 Being top hung, the door was suspended without need of a groove in the floor. 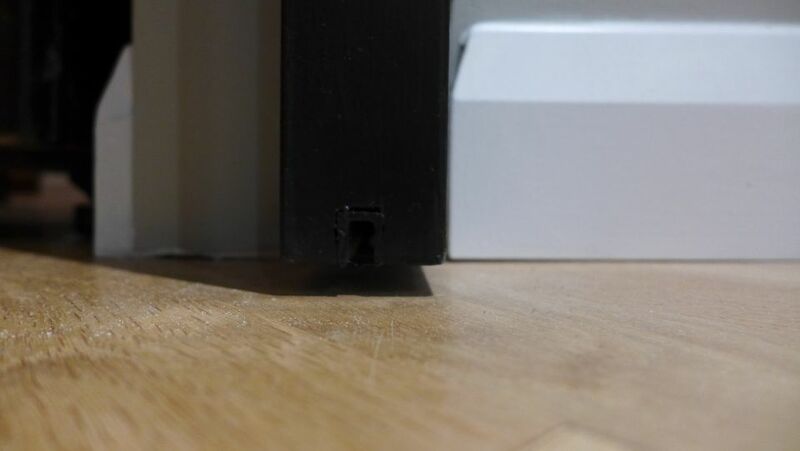 A hidden pin fixed to the floor acts as a guide and provides stability to the bottom channel as shown in the image below. 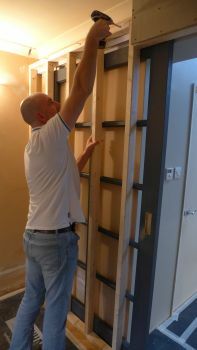 We had to co-ordinate the joiner’s work with that of the contractor who built the partition and decorated the finished construction. 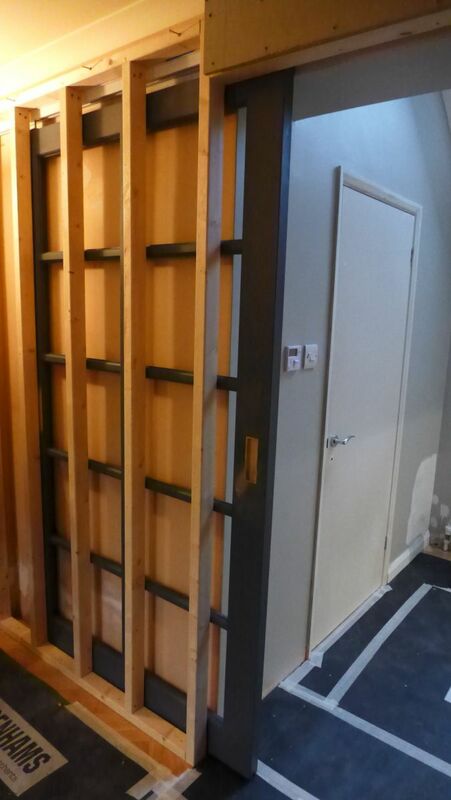 The partition was made from MDF, screwed to the framework. 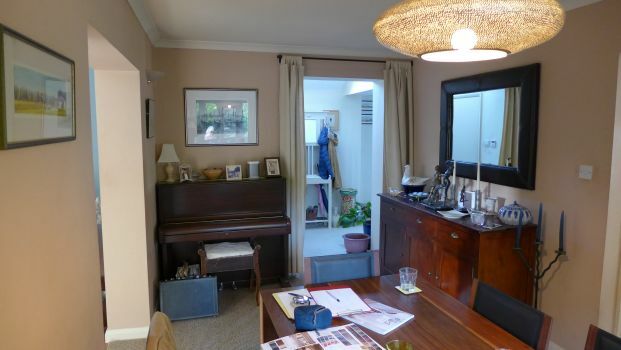 The top edge and bottom edges were finished with coving and skirting respectively to match that in the rest of the room.